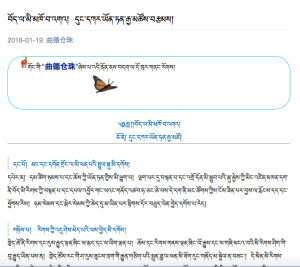 High Peaks Pure Earth presents the English translation of a short piece by Dungkar Yonten Gyatso that was posted on WeChat on January 19, 2016 and has been translated into English by Kalsang Wangdu. This piece of social commentary is an interesting insight into Tibetan society today and how certain public figures are viewed, particularly following the articles A Reflection on the So-Called “Ten Virtues” by Khenpo Pema Tsering and “A Message to All Tibetan Youth” by Thubten Phuntsok. Thank you to Kalsang Wangdu for submitting this translation and do visit Merab Sarpa where this article will be cross-posted. For example, those who often break monastic vows and lack spiritual erudition, and especially those with the name of a reincarnate Lama who are not working for the benefit of Buddha Dharma and sentient beings, are detrimental and destructive to Tibetan Buddhism and the economy. This should be understood by the people, and by avoiding blind faith, bias, greed, and selfishness; people should discard the filth and extract the essence. Since you are descendants of a nationality with ethnic identity and lineage; with a spoken and written mother-tongue; with religion and culture; and with history and land; even if you cannot help your fellow brethren, it is better not to harm them. Not only that, there are some officials belonging to the nationality who are welcoming the outside enemy and giving land and water to them. Driving the nationality empty by secretly exploiting its internal resources, you are an enemy of the economy. And by leaving children in the hands of others, and not even using the spoken and written mother-tongue, you are an enemy of the culture. By not understanding ethnic education and law, you are a demon to the progress of the nationality. These types of officials are not needed for the country or for its ethnic nationalities. We should always nurture genuine officials who benefit the country and its ethnic nationalities, and who care for the spoken and written mother-tongue of a nationality. This is not only contradictory to the country’s constitution and its regional autonomy laws; it is also against the PRC’s cultural protection and linguistic revitalisation principles. For an ethnic nationality, this is unnecessarily thwarting its progress, and it is a battlefield leading to the loss of the ethnic nationality. Therefore, we should clear all doubts of the general public and educated individuals to have a better understanding of the law and patriotic re-education; patriotic feeling towards the country; patriotic feeling towards the ethnic nationality; and love towards the culture. Not only that, let us not burn into dust the lives of future generation in this meaningless school education. To speak truthfully, schools that do not teach the spoken and written mother-tongue are, in a real sense, battlefields where the language and identity of the nationality is destroyed completely. Although there are different laws dealing with religion and politics in the past as well as now, these have to be mainly assessed by its appropriateness for the time and place. Driven by prejudice and faith, and overlooking its appropriateness to the time and locality of the ethnic nationality, laws implemented by order and force belong to a dictatorial system, and are not beneficial to all. If the newly constituted laws are consistent with the time and place, then that should be self-appreciated and voluntarily followed. Not supporting such laws due to the influence of fame and jealousy, and indulging in ill-speaking and obstruction is completely not right. Moreover, by not insisting on faith and prejudice inherited from the past, the newly made beneficial laws should not be sent falling from the precipice.